"Thick and hearty, creamy and good, perfect for a winter breakfast with the family. 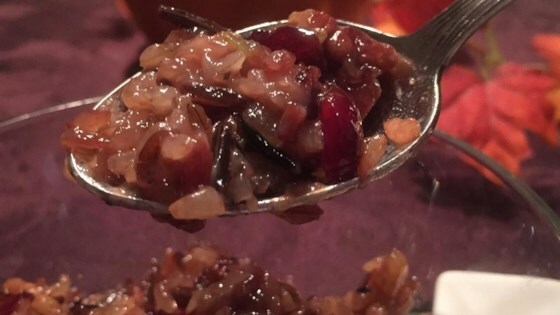 Use good-quality long-grain wild rice, not broken or soup-grade." Stir cooked rice, cranberries, hazelnuts, and maple syrup together in a heavy saucepan. Put saucepan over medium-high heat and cook until the mixture is heated through, about 3 minutes. Pour cream over the rice mixture; stir. Continue cooking until the cream is heated, about 2 minutes. To cook wild rice: At least 1 hour ahead of time, bring 4 cups water to a boil in a saucepan. Add 1 cup long-grain wild rice and bring water again to a boil. Cover pan and simmer rice until tender, about 45 minutes. Drain rice of any excess liquid in a wire mesh sieve. Store in airtight container until ready to use. Dried cherries and blueberries can replace some or all of the cranberries. Try a mixture! Slivered almonds are a fine substitution for the hazelnuts. I was not crazy about this. I followed the recipe exactly but it just isn't something I would make again.